Google has released its latest Android distribution figures, Android Jelly Bean is now on more devices that Gingerbread, which a total of 37.9 percent on all devices. 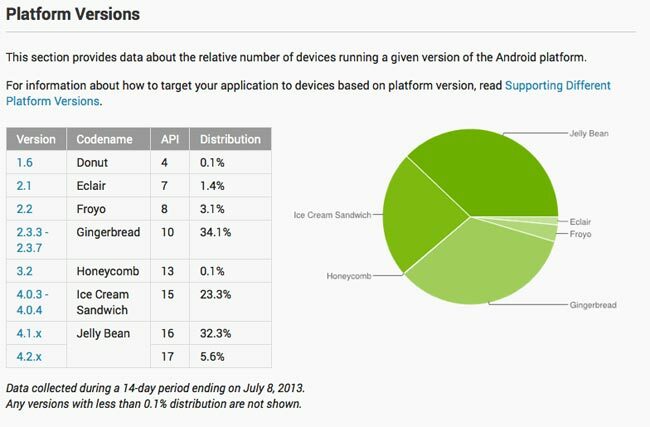 Android Gingerbread is on 34 percent of Android devices, which is then followed by Android 4.0 Ice Cream Sandwich, this is now on 23.3 percent of devices. The remaining Android distribution is split between Android 2.2 Froyo, which is on 3.1 percent of devices, Android 2.1 Eclair which is on 1.4 percent of devices and Android 1.6 Donut which is on just 0.1 percent of Android devices.